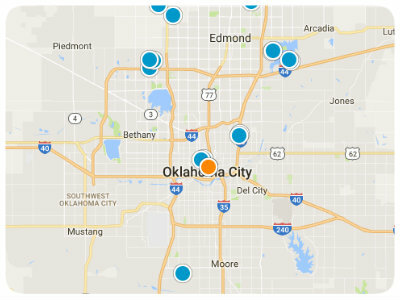 Oklahoma City residents can strike a balance between relaxing at home and taking part in the metropolitan activities of the area. 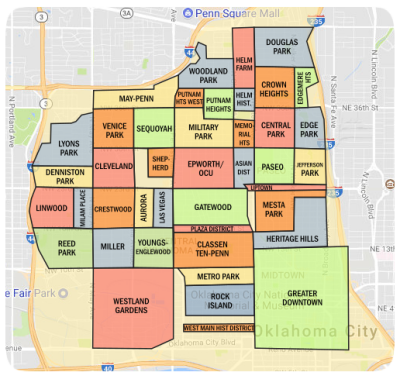 Many Oklahoma City, OK four bedroom homes give the feeling of living in a quiet park district, separate from the popular, bustling neighborhoods and suburbs in the Oklahoma City area. Oklahoma City is one of the only cities in compliance with the federal Clean Air Act, so there is plenty of fresh air and abundant outdoor activities in the city and in the surrounding area. One of the benefits of living in Oklahoma City is the enormous selection of cultural and public events, including a large number of fascinating historical attractions that draw tourists from the state, the country, and the world. Oklahoma city is located along major highway thoroughfares between Texas and Midwestern states, with easy travel to and from major cities such as Dallas and St. Louis. The Oklahoma economy thrives on the trade of livestock, and the county fair draws huge crowds of residents and vendors. The cowboy culture is celebrated in the pristine halls of the National Cowboy and Western Heritage Museum. The downtown area is maintained with pride, full of government and modern business offices. An afternoon trip around the grounds of Oklahoma State Capital gives a view of local historical center showing maps, documents, and historical artifacts from the Oklahoma City region. Another major, modern attraction is the Oklahoma City National Memorial, overlooking the river and honoring those who lost their lives in the Oklahoma City bombing. Other major historical sites include the Biltmore Hotel, the Hales building, and the Criterion Theater, all preserved with pride through strong support from local residents, businesses, and the city government. Some more modern attractions include a new baseball field, a brand new central library, and the city’s famous Bricktown neighborhood, featuring acclaimed local restaurants, clubs, and shops with the personality of old Americana. Nearby, commercial boats take visitors on relaxing rides up and down the Oklahoma River canal for an afternoon of sightseeing. Four-bedroom property in Oklahoma City, OK often attracts families. If your young family is growing, the kids can enjoy the Oklahoma City Zoo, which houses domestic animals, livestock, and exotic animals from all over the world. The children’s petting zoo is particularly popular. The city has beautifully renovated the Crystal Bridge, which is perfect to cross in an afternoon stroll. Other major sites include the Science Museum Oklahoma, the Oklahoma History Center, and the Museum of Osteology. The Myriad gardens are also conveniently located downtown, covering 17 acres of beautiful landscaping, strange and unusual plants, and interesting public events all year round ranging from rainforest ecology to master gardening. The work of local artists is proudly displayed throughout the gardens. Several large lakes at the outskirts of Oklahoma City draw impressive crowds during the summer months. Some popular activities include fishing, picnicking, and camping, with easy access from major freeways to the city downtown. The relatively mild climate of the region provides plenty of time for outdoor activities and sports events. Oklahoma City is a phenomenal place to live and work. It has a booming economy with one of the lowest unemployment rates in the country, ample services, and several major companies in the area. The downtown of Oklahoma City is particularly vibrant, with ongoing construction to support new office and retail space. Living in a four-bedroom house in Oklahoma City gives access to all of the benefits of living in this comfortable metropolitan center, including the perks of an exclusive community, parks and amenities to suit residents of all ages. Great Duplex Close to OU Hospital! This duplex is a 2/1 per side and is need of a fresh rehab. Close to the hospital so the possibilities are endless!